Here’s how it works: you give me a prompt, and I’ll turn it into a drabble, a 100-word story for you. The best approach, speaking from personal experience, is to keep the prompt between two and five words long, and to avoid getting too specific. For example, something like “werewolf shampoo” can lead all sorts of directions and gives me something to work with. With publishing’s gatekeepers now comprising the bulk of short fictions’ readership, I think it reasonable to say that for every story read at least one rejection slip is also read. The rare instances in which writers’ stories are not rejected and to some degree published and possibly read by others are offset by writers’ publishing their rejection slips on public blogs and forums and disseminating them in emails. Similarly, publishers’ returning the same rejection slip to many writers is offset by writers submitting the same story to many publishers. So even ignoring that rejection slips, unlike the stories that inspired them, are almost always read in their entirety, taken to heart and remembered, it all more than cancels out. Ergo rejection slips are the most widely and attentively read short literary genre. Each convention has it’s own personality, just like how every city has it’s own personality. Stumptown Comics Fest has one of the best personalities of all the conventions I have attended. It has a very do-it-yourself feel to the entire convention, with a strong feeling of optimism. Most of the artists and storytellers are self employed, or a part of a small artist collective. In fact, most of the tables are webcomics. 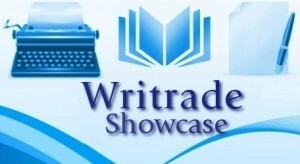 New Website Launch: Writrade Showcase! Just launched this week, and offering a big swag of give-aways for the week-long launch, the Showcase takes a different approach to other promotion sites. We actually do our best to send people away! My first novella, The Lucid Dreaming, debuted at the con, and seemed to be very well received. Sales were brisk, and by Saturday I was getting lots of, “I read the first 40 pages last night and it’s gooooood”. Hal Bodner became my unofficial publicist, grabbing innocent passersby and forcing them to buy copies. This past Labor Day weekend was my very first time attending Dragon*Con as a publishing professional, and really my first “real” time at all. I say first “real” time because I went three years ago for a single day to see Jetse de Vries, who was there at the time with Interzone. I spent most of it with him at his table, watching the crowd pass him by for the guy next to him installing vampire teeth (at $60 a pair, using the same dental instrument and, seemingly, not bothering to clean it between applications). I left with the (mistaken) impression that it was a weird goth con with nothing to offer the book trade. This year was … different. I should probably stop right there before I slam the poor con com. But now you’re curious, aren’t you? Well, when Dennis Gagaoin said that we were about to reap the benefits of the con com’s months of fighting, that was clearly not a good sign. I’m not sure if the program they had originally planned fell through because someone bailed or they never truly spent time organizing the opening ceremonies.